As one of the oldest and most respected academic institutions in the world, the University of Cambridge needs little introduction. With a sprawling campus ground, a history that dates back to the 13th century and a long, long list of distinguished graduates, it should come as no surprise that students from all over the world dream of studying here. It’s also unsurprising that, with its fascinating collection of museums and libraries and striking architecture, tourists from all over the world come to explore the University area. Cambridge is home to 31 colleges, each of them beautiful and sacred halls of learning and each of them with their own charm. These institutes have educated the likes of Sir Isaac Newton, Charles Darwin, Stephen Hawking, Lord Byron, Alfred Lord Tennyson, Jawaharlal Nehru and C.S. Lewis. All kinds of great minds were nurtured within these walls! King’s College and its Chapel: This is the most popular attraction in Cambridge, with the Chapels splendid form towering over the town and its Christmas special broadcasted all over the world. Revel in its beauty and try to catch the choir at work. Queen’s College: Founded by Queen Margaret and Queen Elizabeth in 1448, this beautiful college stretches over the river Cam. Home to the famous ‘Mathematical Bridge’ and a spectacular, medieval Old Hall, this famous college is well worth a visit. Trinity College: This world famous college has a beautiful courtyard and the famous Wren’s Library, filled with handsome, medieval bibles, a few of Isaac Newton’s possessions, a Winnie the Pooh manuscript and countless other literary gems. The library is accessible even when the college is closed. St. John’s College: Who wouldn’t want to see one of the oldest educational institutions of the English speaking world? There’s also the romantic ‘Bridge of Sighs’. Saint Catherine’s College: Though comparatively small in size, this college’s reputation cements it as one of the front runners, both academically and in terms of sport! Its three sided Main Court, made out of brick, is a sight to see. Homerton College: The newest college in the group, its architectural style stands out from all the other buildings that surround it. With a gorgeous orchard and far-reaching grounds, there’s a lot one’s eye to enjoy, not least striking Victorian hall. The Backs: These are the well maintained gardens that lay behind the colleges. With grounds full of delicate flower and soft grass, this is a popular meeting ground for Cambridge students. This is where you will find the ‘Bridge of Sighs’. The Botanical Garden: This green island of calm away offers a few tranquil minutes of peace to the weary traveller. Its bed of native British plants, ‘genetics’ garden and a collection of about 3,000 species of plant life from all over the world make this garden a must see. Jesus Green: Home to a tennis court and swimming pool, this little parkland is also a piece of calm away from the city centre. The Fitzwilliam Museum: Arguably the most interesting attraction in all of Cambridge, this museum is home to an incredible collection of masterpieces by the likes of Monet and Picasso, an extensive collection of ancient artefacts from all over the world, and a whole host of amazing pieces of art and history. The museum itself is a visual treat, and with no entrance fee, this brilliant museum will provide hours of fascination. Kettle’s Yard: Contrastingly, this former family home houses a more contemporary collection of artwork, with pieces from the early part of this century and a separate gallery for modern and contemporary art. Conversations, workshops and discussion groups makes it an interactive gallery, creating a fun atmosphere for learning and appreciating the beauty around you. There are even musical concerts, which are sure to keep everyone in good spirits. The Sedgewick Museum of Earth Sciences: This is the University’s oldest museum, and is packed full of fossils that are more than 1000 million years old! Expect galleries filled with gemstones, the world’s largest spider and too many unearthed treasures to mention. You’ll have to see it to believe it. The University Museum of Zoology: Open only from June-September, it’s here you can learn the evolutionary relationships between animals, study a wide range of fossils and basically uncover the mysteries of life on Earth. The Whipple Museum of the History of Science: This is a unique collection filled with sundials, telescopes, pocket electronic calculators and a variety of equipment and devices that were once used to uncover the mysteries of the world. Museum of Archaeology and Anthropology: Pretend you’re Indiana Jones and witness treasures unearthed from deep within the soils in Europe, Asia, Africa, South America and the Mediterranean. Reflect at the tools and possessions of ancient civilisations long gone, all from the comfortable displays in this grand museum. Museum of Classical Archaeology: Here you’ll get the chance to view thefew surviving collections of casts of ancient Greek and Roman sculptures and shards of pottery from these times. Art and history combined. Polar Museum: Situated within the Scott Polar Research Institute lies a unique collection of artefacts, journals, maps, photos and other documentation illustrating polar exploration! Especially relevant in today’s times, these exhibits help us understand the world climatic conditions and their relations to the ice caps. The University Library: Filled with literary gold, this is a bookworm’s sweetest dream. Whether you’re here as a prospective students or just traveller, looking to learn more about Cambridge, visiting the University grounds and its many museums, gardens and colleges might just leave you learning more about the world in general! Beauty meets brain in the University of Cambridge, and you’ll leave filled with memories of both. Also, visit the popular attractions in the city by following Cambridge itinerary 1 day. It’s very important that you check online or call in advance to ensure the colleges/museums/gardens are open at the time of your visit. This is a place of learning so please be careful not to disturb any of the classes or stare into people’s windows. Only enter the buildings you are explicitly invited to. Admission to all the museums is free of charge. Admission to Trinity’s Wren’s Library is free of charge. It’s highly recommended that you visit the website of whichever institution you wish to visit for further details. Hours vary according to whether the college is in term or on holiday. The colleges are usually closed to visitors during the University exam period, at the end of May and the first week of June. By Bus: National Express Coaches stop on Parkside, at the centre of town. The ‘Uni 4’ bus service runs from Monday to Friday. 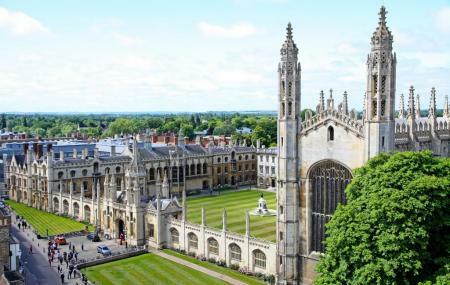 How popular is University Of Cambridge? People normally club together The Twinnings and Stowmarket while planning their visit to University Of Cambridge.